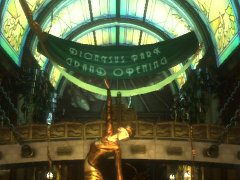 If you enjoyed the multiplayer of Bioshock 2, the upcoming Rapture Metro Pack looks like something to get excited about. In terms of details, there isn’t much to share. Sounds good so far, though if some of the maps are from the single-player portion of the game one would imagine “all-new” might be a stretch. Fortunately, pictures are worth a thousand words, so here’s a couple of paragraphs for you. The price is set at $9.99 (800 MS Points) and it will be released on PS3, XBox360, and Games for Windows Live. No release date yet, but stay tuned.